Sunshine, laughter, family, friends, outdoors. These words come to mind when we think of summer. For the Northern Hemisphere summer is finally here! 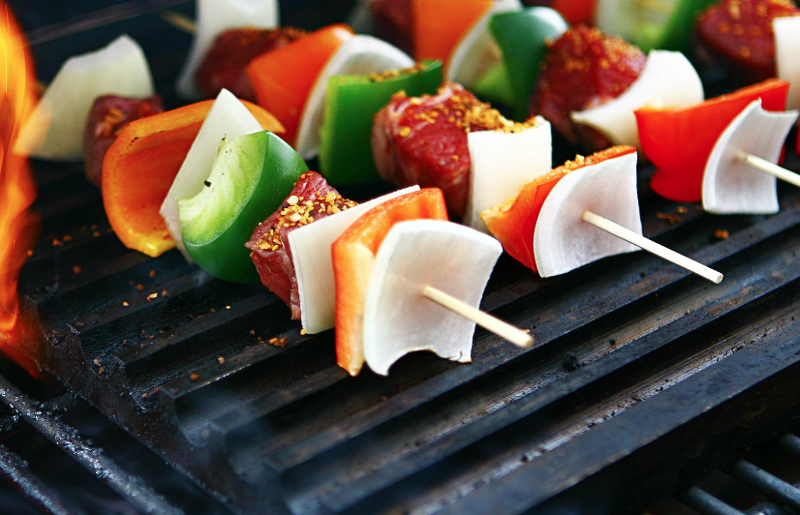 One common association with summer when it comes to food is: grilling. With that in mind, we have developed a recipe for you to try something different next time you have a BBQ; a Filipino twist to your grill. Your non-meat-eating relatives and friends may appreciate to find they can enjoy a “grill party” without feeling left out. These skewers combine our hydroponic veggies with tuna, though you may change it for chicken, or other meat; or might as well suppress meat for a completely vegetarian alternative. Soak the skewers in water for about 10minutes (to prevent from burning). Set on a side. Dice the tuna into 16 pieces. Peel the onions and cut lengthwise into 6 wedges each. Cut the bell peppers into small squares. Distribute the fish and veggies evenly into 8 groups and insert the skewers. Brush the fish and veggies with the sauce. Place on the grill and cook for about 4 minutes per side. Sawsawang Suka (Garlic Soy Vinegar Dip): mix all the ingredients in a small bowl. You may use apple cider vinegar as a substitute for the suka (Filipino vinegar). Makes 1/2 cup (125ml). Source: Authentic recipes from the Philippines. Categories: Bell Pepper, Recipes | Tags: BBQ, grill, skewers, summer, tuna | Permalink.